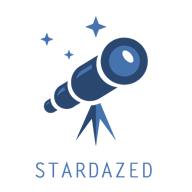 Stardazed supports 3 types of lights: directional, point and spot lights. These are the basic types of lights supported by most, if not all game engines. Up to recently SD had a hard limit of 4 active lights at any time. The light information was stored in a couple of uniform arrays. I limited the number to 4 initially as all lights were processed for every pixel in the fragment shader, whether they were likely to affect the pixel or not. SD currently only has a forward shader where you process all lights every pixel (or vertex) in a normal render pass. In a deferred shader each light is rendered separately and is usually limited to a section of the screen by enabling the scissor test and clipping rendering to the area of the screen affected by the light. Another issue is that there’s a limit on the number of uniform vectors available for use during any one draw call and especially on mobile that limit is quite low. The limit is quite easy to reach with a bunch of lights and other uniforms competing for the same space. I had read an article about an implementation of a tiled light rendering pass in WebGL. A student project by Sijie Tian, it is a nice proof of concept of a technique that allows both forward and deferred shading paths to work with a very large number of lights with good performance, provided that the number of lights covering any area of the screen isn’t too large. In typical scenarios, a level has many lights, but most of them only affect a small area of the map and, depending on the viewing angle, only a couple of lights will affect any given part of the screen, even with many lights in close proximity to each other. Tiled lighting exploits this by dividing the screen up into a grid of square areas and determining before the actual lighting passes are run which lights affect which parts of the grid. Inside the lighting code, a lookup is done in the precalculated grid to get the list of lights that affect the current pixel. So even if many lights are active, the fragment shader will only process the ones that are likely to affect the pixel being processed. The Global Light List is a mostly static array containing the properties of the lights (position, type, colour, direction, shadowing, etc.) In SD, this list directly represents all of the lights in the scene. The Light Manager component operates directly on the data in this array. 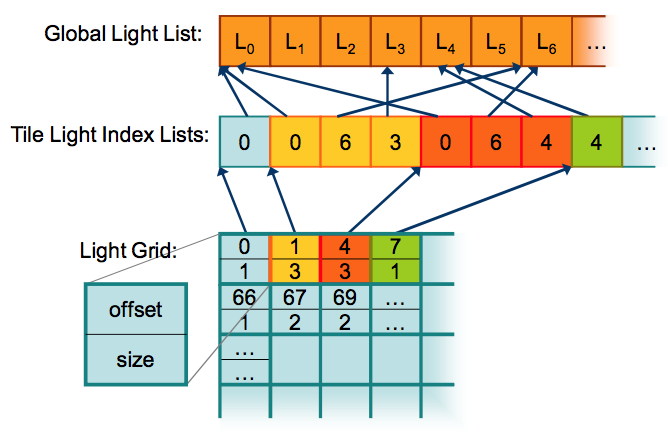 The Tile Light Index Lists is a packed list of variable length lists of indexes into the Global Light List. Each sublist contains the indexes of the lights present in a tile of the Light Grid. This data is updated every frame and will vary significantly as the camera moves through the scene. Finally, the Light Grid is a grid of cells representing a low resolution view of the viewport. Each cell in the grid represents a 32x32 square on the viewport. The paper by Olsson and Assarsson states that both 16x16 and 32x32 tiles worked out well. Since SD has to generate the grid every frame in JS code, I opted for the 32x32 grid as it reduces the numbers of cells by a factor of 4. The size of the grid is locked to the viewport size % 32 so during normal operation, the size is fixed. The first 256 rows of the texture are assigned to the global light list. Each light entry takes up 5 vec4s, which was the main reason to have a width of 640 texels, each row can store 128 lights exactly. Given this, SD has a limit of 256 * 128 = 32768 dynamic lights present in a scene, which should be enough for now. 240 = 614,000 active indexes in any given frame. Because WebGL 1 does not allow a vec4 to be indexed by a variable, I had to add a set of conditionals in the data lookup code as shown below. This is only done once for each light index access so it hopefully should not add too much of an additional load on the shader. WebGL 1 only allows for simple, mostly constant accesses into arrays and basic flow control. The light grid is stored in the final 16 rows of the texture. Each cell taking up 2 components so each texel stores 2 cells. So again, I can store 640 * 2 * 16 = 20,480 cells. Each cell represents a 32 x 32 rect on the screen, so even a retina 5K fullscreen viewport (5120 x 2880) only needs 160 * 90 = 14,400 cells. Given that most WebGL apps run (by necessity) in a small viewport (like 720p), this should suffice for a while. Given a more typical 1280 x 720 viewport with 920 cells, the current max of 614k indexes allows for an average of ~639 lights per cell, way more than reasonable. Of course, right now the texture size is fixed at 640 x 512, but I’m planning to add smaller versions as well for simpler scenes to have as little wasted memory as possible. By having the rows allocated for each structure be variable as well a very efficient lookup table can be created for scenes with a known number of lights. Since the table is calculated on the CPU and only a small part is changed every frame, the GPU texture data is updated by determining which rows in the 3 tables are affected and only sending those to the GPU. The projection is made by calculating the 8 vertices of the cube enclosing the full range of the light in worldspace. Each point is then projected into screen space and the 2D rectangle that encloses all of the projected points is the result. I’m not satisfied yet with the rect calculation and there are some issues to work out, but this was good enough for my current LD entries so I moved on. // and populating the grid. Even though the second block has several nested loops, it traverses the grid data linearly once and iterates over the relatively short span list each cell, and the span list is updated only once per row. As it stands, this works quite well but I took some liberties here and there as part of the code was written during a Game Jam. I will want to have spot lights also projected to either a rectangular area or a cone on the screen (the spans array can represent arbitrary shapes, so that was a happy accident.) The actual calculation of the areas also needs to be cleaned up, it now has some fuzz factors applied to make it work. It worked out quite well for my LD37 entry, Callisto, where I was able to have about 30 point lights in a single room all calculated dynamically without any real trouble on most hardware. 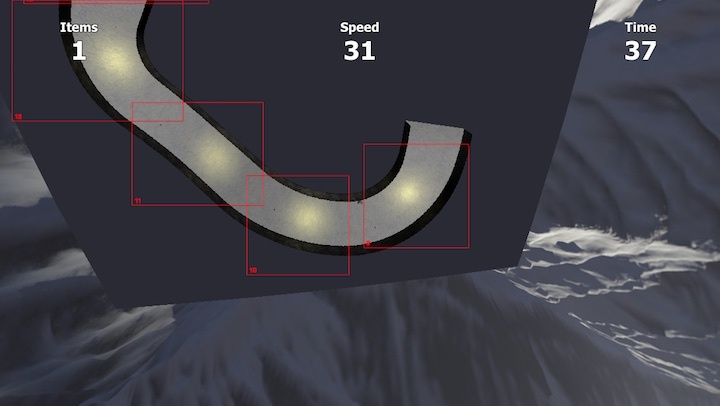 Oh right, light maps. Need those too. FBX is a 3D data interchange format supported by practically all 3D modelling programs and as such has become a de facto standard source format for many game engines. For example, Unity and Unreal Engine assets are predominantly FBX files. Currently, Stardazed can import data from v7.x FBX files in both binary and ASCII encodings and extract skeleton hierarchies, skeletal animations, geometries (meshes only), materials, textures, etc. ready for use in-engine. The final part in development now is the vertex skinning information. To ensure that SD would not get a biased implementation of vertex skinning and rigged models I took a quick detour to import the MD5 file format used by Doom 3. The format is particularly suited to make a reference implementation against as it is clutter-free, well-organised and easy to understand, things I would not immediately say about the FBX file format. 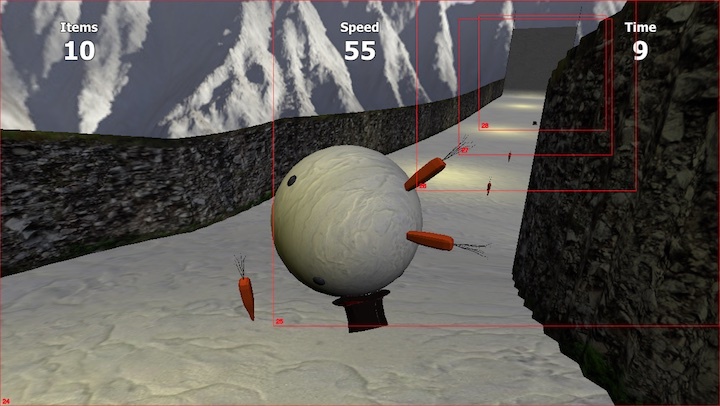 In addition, while Doom 3 is an older game from 2004, the core principles of rigging and skinning have not really changed since then (as far as I know). A model has a hierarchy of joints (or bones) and each of the meshes’ vertex positions are calculated from 1 or more weighted joint-relative positions. While Doom 3 calculated the final positions using optimized SIMD code on the CPU, I decided from the beginning that the skinning would take place on the GPU in the vertex shader. Even if the mythical SIMD instructions ever become generally available in browsers, it’s still more efficient to just let the GPU handle it as we’ve got a lot more GPU time than CPU time available per frame. I initially wanted to just pass in the joint data as a uniform array of positions and weights and then just index into that array with each of weight’s joint index but that is not allowed in WebGL 1. In WebGL we only have vertex attributes, uniforms and samplers to pass data to shader functions. No uniform blocks, texture buffers or stuff like that. In addition, and more importantly, any array may only be indexed by either a constant value or the index variable of a for-loop. Using an arbitrary variable as an index is verboten. vec4 vertexWeightedPos1_joint;   //       "          "          "
vec4 vertexWeightedPos2_joint;   //       "          "          "
vec4 vertexWeightedPos3_joint;   //       "          "          "
The jointData is a texture with 4-component float element pixels. Each joint is encoded in 8 pixels, the last 4 forming a mat4 describing the full transform of the joint in model-space. In the vertex shader, the weight positions are then transformed by the corresponding joint and scaled by their bias and added together for the final position. The main downside of this data layout is that each vertex can have no more than 4 weights. Some of the MD5 models use 5 for some vertexes but ever since vertex skinning moved to hardware I’ve understood that a limit of 4 has become quite common. Additionally, if a vertex uses less than 4 weights, the unused attribute vectors still need to be in the vertex buffer. Simple models will thus have quite a bit of dead weight, but looking at more modern models I’ve seen 3 or 4 bones per vertex being the average so I feel this is a reasonable compromise, especially for a first implementation. Another minor point is that float textures are not part of standard WebGL, but an extension. It is a very common extension though, mostly being unavailable on lower-end mobile phones. I am completely fine with that as those lower-end devices are not very suitable for browser-based 3D games anyway. The image alternates between a visualisation of the joint nodes and the skinned mesh. Joints in Stardazed are just represented by normal hierarchical entities and can be mixed with non-skeletal entities such as the light that I added manually as a child of the lamp’s joint node.